REGISTER YOUR TEAM AND CO-WORKERS TODAY! 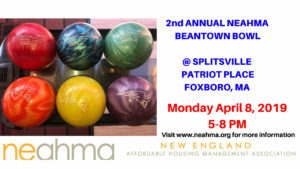 Join NEAHMA for our second Annual Beantown Bowl Event! WIN RAFFLE PRIZES!! May the best team win the Beantown Bowl Trophy!! Bring as many coworkers to join in the fun and celebrating!